Does Saturn's 'Death Star' Moon Harbor A Hidden Ocean? It's not the prettiest thing in the solar system, nor is it the most interesting. But Mimas — a pockmarked moon in orbit around Saturn — does exhibit a rather strange wobble. A team of astronomers say there can only be one of two explanations: either it's harbouring a subterranean ocean or it has an irregularly shaped core. If Mimas does indeed contain a hidden ocean underneath its icy surface, it joins a rather exclusive club, one that includes Europa and Enceladus. Its surprisingly strong wobble, detected by scientists working at Oxford University, suggests that something lumpy or sloshy lay beneath the surface. A 3D model built from images captured by NASA's Cassini spacecraft shows that the moon rotates with an extra wobble, similar to a top spinning slightly askew. Does Mimas have an ocean under an icy cap? In one, a spherical shell of ice wraps around an irregular rocky core shaped like a rugby ball. 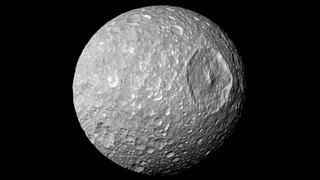 If this scenario holds, [Radwan] Tajeddine says, the "fossilized" core could hold clues to Mimas's formation. He says the core could have acquired an irregular shape by forming first, much closer to Saturn, where the planet's strong tides could have stretched it. Then, the core could have migrated outward and accumulated ice, which, being more deformable, would settle into a sphere. But there still should have been a small sign of the irregular core protruding at the surface, like an elbow poking up against a sleeve, and the researchers found none. That led them to favor the other scenario: an ocean underneath an ice cap 24 to 31 kilometers thick. If it is true, Mimas would join Enceladus, Titan, and Jupiter's moons Europa, Ganymede, and Callisto as solar system moons suspected to harbor an ocean. One problem is that Mimas's ancient, heavily cratered surface shows no signs that water has ever touched it—unlike, say, the freshly Zamboni-ed ice skating rink of Europa. Mimas is also too small to have enough heat-producing radioactive elements in a rocky core to maintain a liquid ocean. But Tajeddine says the gravitational tug of Saturn on Mimas's eccentric orbit could produce enough tidal heating to maintain a liquid interior. Critics say that's impossible — that Mimas couldn't possibly maintain a liquid ocean. As noted in Hand's article, astronomer William McKinnon favors the 'rugby ball' scenario. What's more, he also suggests a scenario that the researchers failed to note: "the detected wobble could have been knocked into existence by something that has nothing to do with the moon's interior: a comet impact." Too bad the moon doesn't feature any tell-tale signs of the proposed impact. OH WAIT — WHAT'S THAT GAPING 87 MILE-WIDE HOLE DOING THERE??!! Read the entire study at Science: "Constraints on Mimas' interior from Cassini ISS libration measurements".